Friday Photo: Not the Sofa! I probably should’ve saved this one for Christmastime, but I just couldn’t wait. When oh-so-helpful intern Tara handed me a file folder containing this picture this morning I just knew it had to be today’s post. It incorporates so many of my favorite topics: pseudo-colonial costumes, bad museum practices (they’re sitting on the antiques! ), and, of course, silly hair. This is the cover of the Baltimore Sun’s TV Week magazine from December 24, 1972. 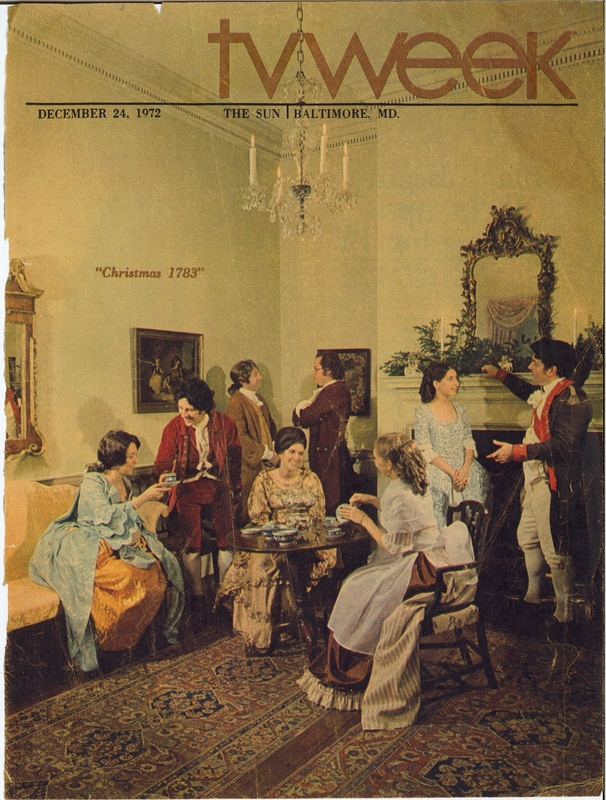 A description of the picture is on the reverse, and it says that the Maryland Center for Public Broadcasting produced a special called “Christmas 1783,” which was taped in the Hammond-Harwood House. It was apparently “a re-creation of a holiday party of Colonial days.” If only we had a tape of the special…I can only imagine what other museum no-nos they committed during filming. In case it’s not clear, sitting on the sofa is now officially against Hammond-Harwood House rules! This is not a simple ceiling. It’s also not at the Hammond-Harwood House. This is one of the ceilings in the Chase-Lloyd House, our neighbor across the street. The interiors of the Chase-Lloyd House were designed and executed by William Buckland, who was also the architect of the Hammond-Harwood House. We don’t have any ceilings like this, only simple, undecorated ones, and I think someone in the past must have been a little jealous. One of the enduring myths at HHH is that William Buckland designed an elaborate ceiling for our stairhall but that he died before it could be constructed, and that the plans for it were then included in the list of items advertised in the Maryland Gazette by Buckland’s wife Mary as being available for purchase. The truth is that this story unfairly maligns Mary Buckland. There are two advertisements in the Gazette for sales of items belonging to William Buckland, but no ceiling plans are mentioned. On December 15, 1774, Mary and the other two executors of the estate, John Randall and Denton Jacques, placed an advertisement announcing the sale on the following Tuesday of “a parcel of household furniture,” six indentured servants, and two slaves. 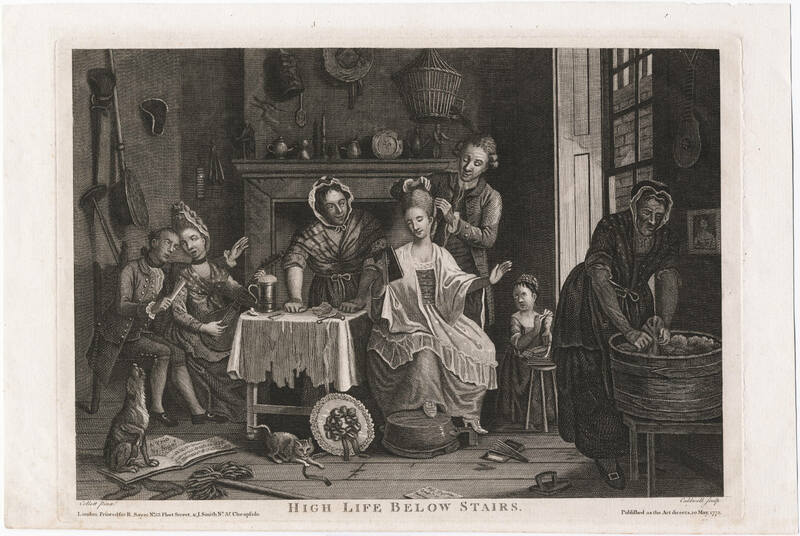 On May 9, 1775, Jacques advertised the sale of Buckland’s house and “the remaining part of the deceased’s household furniture.” As you can see, there is no mention of a ceiling. The only place anything about a ceiling pops up is in the inventory of Buckland’s estate, which includes 2 “ornamented ceilings of paper.” It’s possible but unlikely that one of those paper ceilings was destined for the Hammond-Harwood House, since papers were not installed anywhere else in the home. So, I think we’ll just have to get used to envying our neighbor’s ceiling. 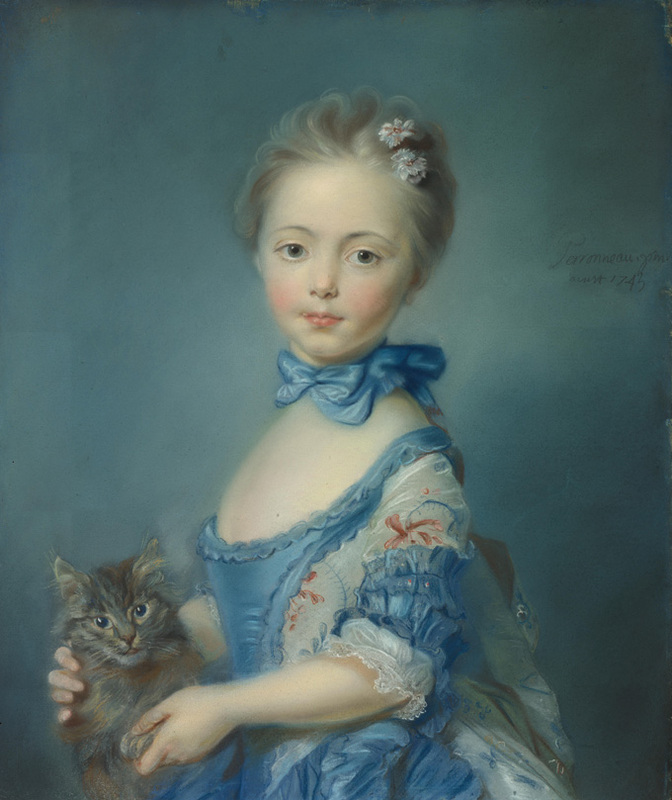 I think Peabody and I should have our portrait painted. She could represent the wildness of nature intruding upon my ability to sleep in. 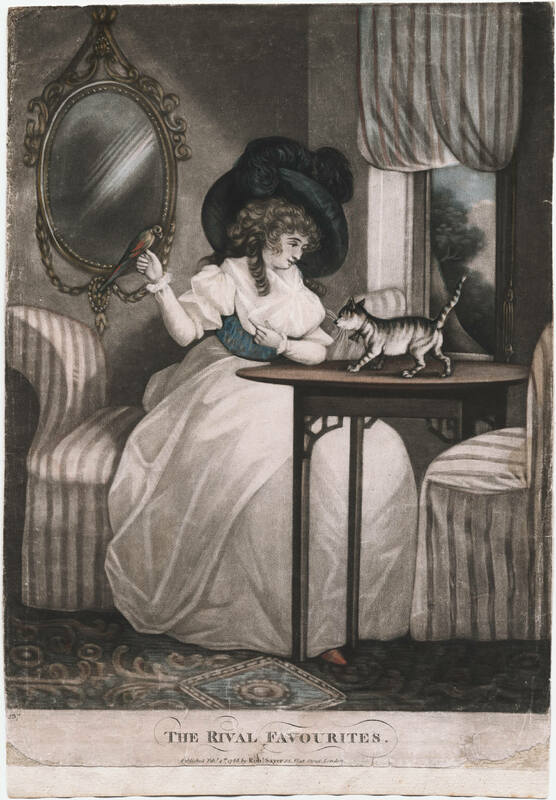 Hope you all have a restful weekend, undisturbed by misbehaving pets! 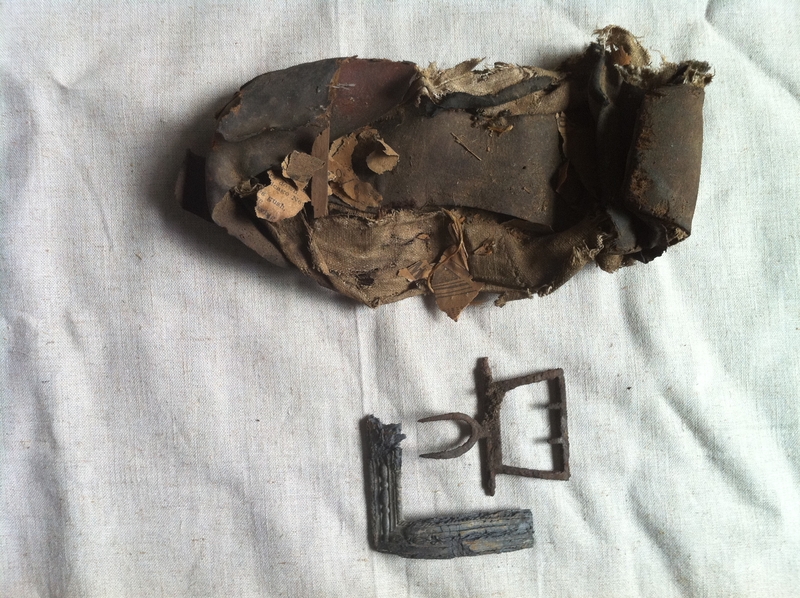 That is the shoe and shoe buckle pieces that were found in the cornice of the roof during the roof restoration project. I recently asked the shoemakers at Colonial Williamsburg for their opinion on the date and construction of the pieces, and today I got their response. In their expert opinion, the buckle frame (the half-rectangle) is made of lead and dates from the 1770s-80s. The chape (the part of the buckle with the prongs), could date from the 1760s or 70s. So, the two pieces may go together and may not. The shoe (and this is the exciting part for me) is a 19th century women’s shoe! It’s exciting because even though I am nowhere near a shoe expert I managed to guess correctly that it was a lady’s shoe from the 19th century, when slipper-like styles were all the rage. Of course, the professionals were able to discern much more detail than I was; shoemaker Valentine Povinelli describes it as “woman’s black leather calfskin shoe” with “a silk bound edge, a whip stitched linen lining and a whip stitched side lining.” He says that the shape of the toe dates it to 1835-55 if it is completely handsewn and as late as the 1860s if there is any machine stitching. The level of detail the shoemakers were able to discern from just a picture is truly impressive, and I appreciate their expertise!